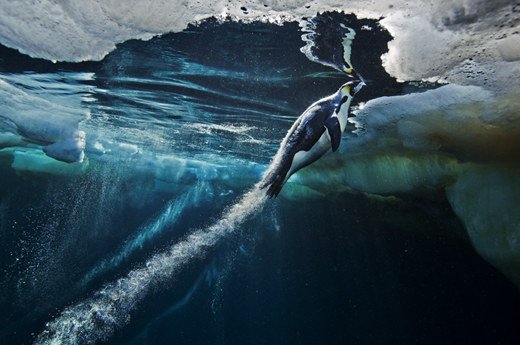 Paul Nicklen's photo series of Emperor Penguins won first prize in the 2013 Nature Stories category. One of the premier photojournalism competitions, the 2014 World Press Photo contest, is now open for entries to professional photographers. The deadline for submissions is January 15, 2014 and the winners will be announced on February 14, 2014. An international jury of professionals in the field of photojournalism will pick first, second and third prizes in all categories. First prize winners in each category receive a cash prize of €1,500 (~$2,065). Winners of second and third prizes, and those receiving honorable mention, receive a Golden Eye Award and a diploma. The top award, the World Press Photo of the Year, carries a cash prize of €10,000 (~$13,764). A user name and password are required to enter. If you have entered the contest in previous years, you will need to register again. The deadline for requesting a user name and password is January 9, 2014. No Muslims slaughtering each other in my town so I wont bother to enter. In a few years you will get your chance. Anyway without discussing the outstanding quality of this year winners photos, I just want to say that as far as I'm concerned, photo contests (and maybe almost every contest that can be) are suspicious. The WHO judge, the WHY and the WHY NOT and possibly the HOW are too ambiguous if not shady. Do you realise that these Professional photographers actually put down their cameras in the mud and dirt instead of wrapping them up in cotton wool? A little bit of dust or oil is nothing to them. and I'd say 9/10 don't actually own lens caps! I like Photo 6 and 8 on the liked page way better. This one is good too though. But: 1)They are professionals who get paid for their jobs. 2)They mostly concentrate on bad things. 3)The photos are mostly unimpressive. What I mean saying unimpressive is that the shots, separated from their story, do not look great. It's like the shot with three black guys laying on the sand, but hey, they're are refugees from Somali after a night on the boat across the gulf of Aden. Captions make the story, not the shot. All of above is my opinion. I knew a few winners while I was living in Colombia, and yes, they winning photographs was about kids with bullet in they head or without legs. Yes, we all know that they work in conflict areas, but there are also more than this. a few shots of dead children should be enough. Yup, that always seems to impress people. Sick and old people who can't run or women from the back are also highly regarded targets. I think they call it street photography these days, some people think it's some kind of art. For professionals, to be nominated is a big deal, it is recognition for a lot of hard work by their peers. These people are not pixel peepers, they put themselves on the line daily, challenging themselves to get great images, to tell important stories. These comments are ridiculous. These are working pros turning excellent, dramatic work daily, sometimes under extreme conditions. If I go out and shoot all day and I delete all the images because they're crap, oh well, I had a fun day. These guys may not get paid that day! Take a look at last few year's winners. If you can't say that they are excellent images, you need to reconsider your hobby. I think is a difference about being on the payroll of a newspaper, magazine, whatever news source it is, freelance or not. It does not matter if the shot was good or not. Put me in the room with all the gore and I can take the same shot, so it is not a matter of skill. How would you like to see someone you know dead on a public web site and learn it was a contest for money. Its the "Hunger Games", art imitating life. It is like, I need a new lens and I have the means to get to XYZ war zone or a press pass for access to whatever and lets wait for a bomb to go off or a riot or earthquake with the mindset this is for contest for money. I guarantee you the whole atmosphere would be different if money was not involved. I think it is a discussion for ethics and morals when it is Not for an actual job you are hired to do vs a contest. Why can't a skilled photographer win a contest without showing (graphically) this, That is even easier, Human Nature is to slow down as you pass an accident. Ryan - don't be an idiot. No one enters this contest for money. These are working journalists and photographers who enter images that they happen to have taken over the last year they have worked. They would still take the images regardless of the contest, which is about the accolade, not the money. Photography has the power to influence what we feel about war, violence and hatred and can be a powerful agent for social change. Only a portion of the total contest entries are about war or disaster. You should really research and think about these things more before commenting. And you can take the same shot...really? Look we have a Troll, must be hungry. Complaint filed. If there's a troll lurking about, ryan, you'll have to look in the mirror to see him. Complaint filed indeed. For what, intolerably clear thinking? I looked at the gallery of "winners" it seems this is about who can shoot the goriest and most tragic image. All I have to do is watch the news every night and it is the practically the same thing. I guess the saying if it Bleeds it Leads holds true... It is amazing you can win money off of others suffering.